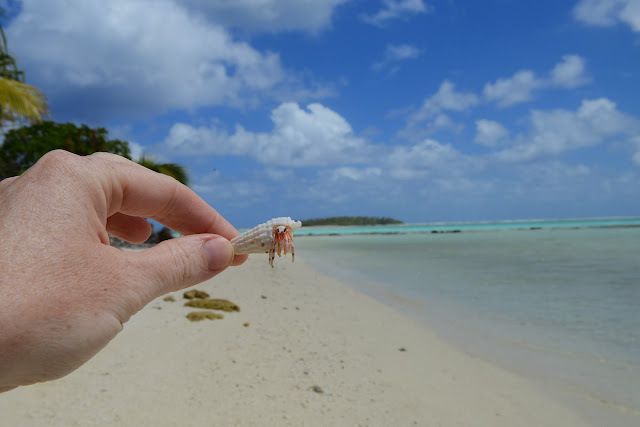 Hermit crab on Aitutaki, possibly the most beautiful place in the world. 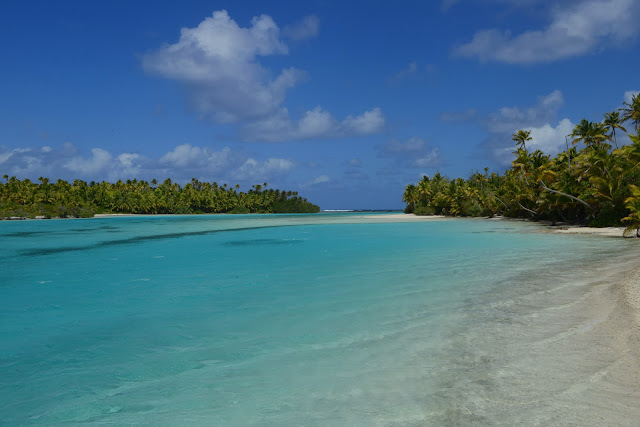 The Cook Islands is home to variety of hermit crab species, the cutest decapod crustaceans around. Initially I had no idea who was making those mysterious tracks across the sand every night…til I traced a set to a conical shell that wobbled slightly. After a minute or so a pair of delicate antennae emerged, followed by a stunning set of legs that appeared to form a skirt that carried him or her away. Is anyone home? 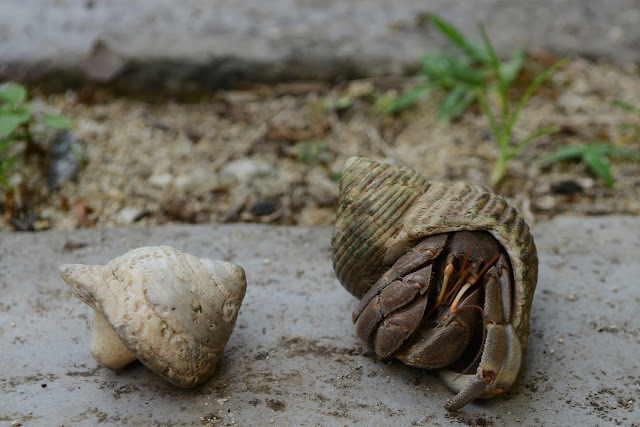 This damaged shell gives us a peak at the way hermit crabs fold their legs when they are hiding or "shutting the front door"). If you wait they slowly emerge, antennae first (hard to see in this pic but they're orange) then legs. I’ve seen hermit crabs sold at pet shops but never lived with nor spent much time with these critters. They love to get around. Some of them walked from halfway up the beach right to the doorstep of my accommodation (a few hundred metres at least). It made me seriously reflect on the lives of the hermit crabs I've seen in pet stores and by extension their lives at home...do they have enough space to carry out their natural behaviour? 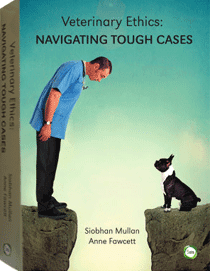 Is isolation detrimental? (they seem to love hanging out in groups). How do you enrich the environment of a hermit crab? They certainly seem pretty cluey (and they can definitely feel pain). Here are a few things I learned about them this week. Hermit crabs don’t look like your average crab. When they are naked or without a shell, they tend to have a soft, asymmetrical abdomen, curled - all the better for spiralling into a conical shell. 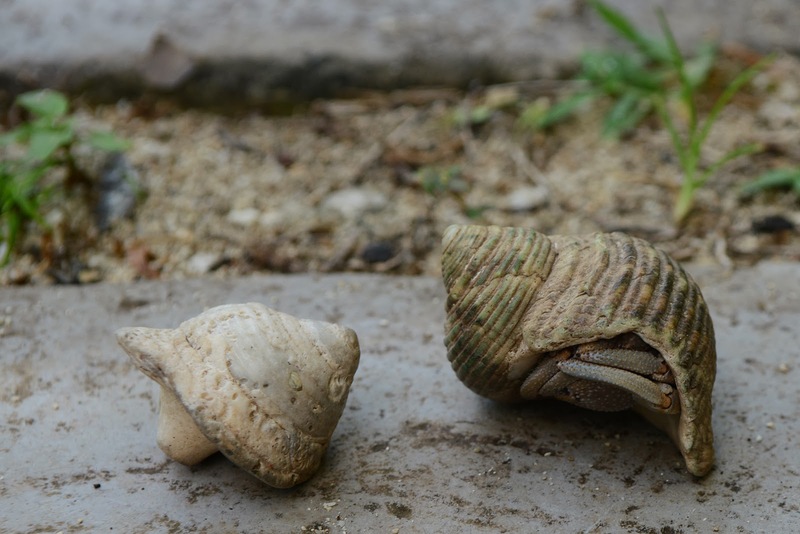 They use second-hand shells to move into, but are known to move into non-shell homes: garden ornaments, bits of wood, or Lego – they’re adaptable. New homes must be found as crabs grow bigger. 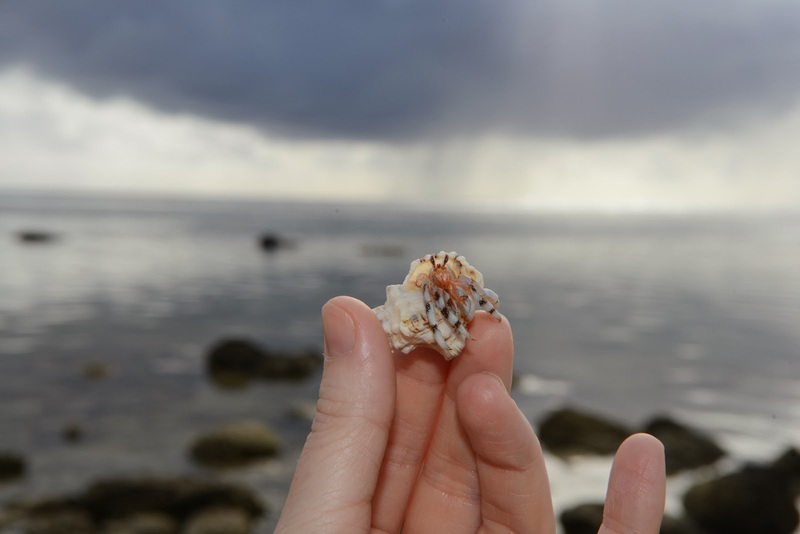 A good shell is hard to find, which is another reason why beachcombers should leave their finds on the shore. (You can watch a shell change here). 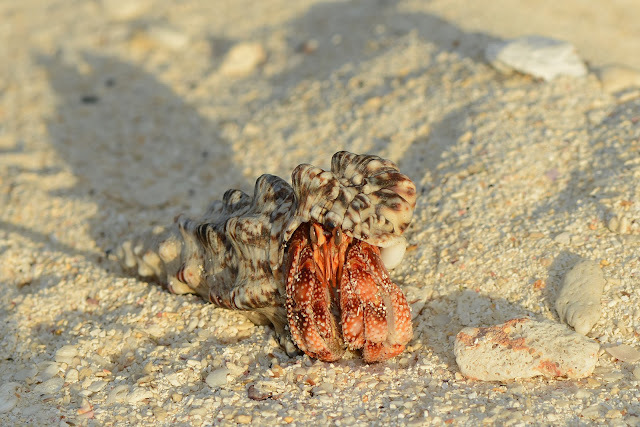 They get into some serious fights over shells, sometimes prying another crab out to steal his or her home. Some species use “vacancy chains” when moving into a new shell. When it works well this involves the formation of a queue around a new shell, with the largest crab first in line. He moves into the shell, then the next-biggest crab moves into his shell, and so on. Interestingly, the hermit crabs on Aitutaki (population 2000) were MUCH more outgoing and less shy than those on Rarotonga (population around 13000) which raises the question of whether they are more vary of humans the more interactions they have. For which I might add I am responsible too. One of my favourite hermit crab sites is Project Hermies which clearly began as a school project. 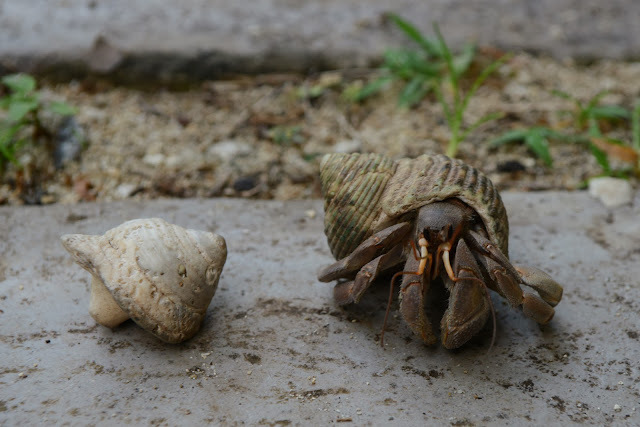 Another fabulous thing about hermit crabs is that they tend to congregate in stunning locations. Its definitely worth meeting them in their own territory. Hermit crabs live here. They're doing something right!